With Netlink Bill, the possibility of disbursing bills regarding public businesses and organizations, telecommunications, phone, internet services and making various other payments is offered through a broad authorized branch network of Netlink partners. By adopting the EBP Consolidator model, we simultaneously achieve connection, data tracking and parallel rendering of services to all involved parties. In every case, the services provided have speedy direct connection (online) and processing, reporting and all supportive services offered (statistics, forecasting, credit analysis etc.) as identifying traits. Payment of bills is rendered easily, quickly and reliably with the consumer’s visit to your POS, where desired payment is made in cash and evidence of payment is received via Netlink’s terminals. Click here to download the application and then select “Run” to begin installation of application. Follow the instructions given during the installation by responding affirmatively to all questions regarding software license agreements of third parties (mainly Microsoft) and installation of relative products. During installation process you must be connected to the internet. The first installation may take from 5 to 20 minutes depending on your computer’s abilities and your internet access speed. Following the completion of the installation, the application begins automatically and the below consent form regarding software license agreement appears. Please choose Acceptance to continue. Afterwards the following form appears. In order to use the relevant application ACTIVATION IS REQUIRED. 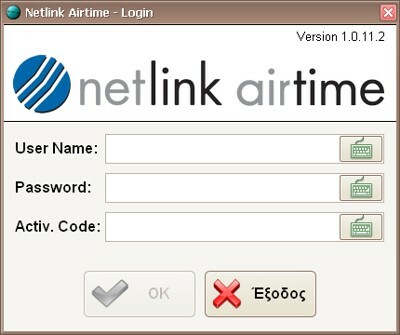 Be a syndicated partner of Netlink airtime electronic use. Please enter information provided by Netlink. Note: During activation process you must be connected to the internet.